A Link To The Future Tee Design Review. The A Link To The Future tee design is for the Back to The Future and the Legend of Zelda fans. The concept for the A Link To The Future tee design is that it focuses on the time traveling element of both of the popular franchises. It features an Orange vest and power laced sneaker wearing Link instead of Marty McFly on a Hoverboard decorated with the Triforce instead of Mattel crap. And the Doctor Emmett Brown's personality is and attributes are given to Navi instead such as the Sunglasses hair and catchphrase "Great Scott!". Other references to the Legend of Zelda include Link's Green hat, his Master Sword, and the Ocarina of Time. As for the artwork, The coloring and shading fit a cartoon style. More shading would had been good considering the shading on Link's pants, you know just to keep things consistent. There is some foreshortening as Link reaches for the Ocarina that is falling. The glow effects of Navi, the Hoverboard, and the lightning means that this design will look better on the darker fabric colors. The A Link To The Future tee is perfect for the Legend of Zelda fans that are equally passionate about 80's movies. A Link To The Future Tee Design by Matt Parsons. 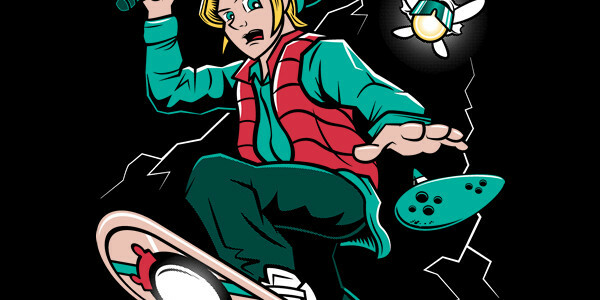 The McFly tee design is for the Back To The Future II and extreme skateboarding fans. The concept is to have Marty performing traditional skateboard tricks to hoverboarding. That's it and it works. Taking something that is as iconic as the Hoverboard and McFly himself and imagining the possibilities of that combination raises the bar conceptually. It seems odd that we've never seen him perform these kind of tricks before, in the movies or fan art. I mean we all know he can ride and evade but to think he can do the Tony Hawk type stuff is mind blowing. I sense a Marty McFly Pro Hoverboarding Video game in the future. As for the artwork, it is simple, clean and effective. It is a bit like stencil vector art as there is more than minimalism but less than realism. There is some light shading but not enough to be considered dynamic, it is just enough to keep it form being flat. The colors are as true to the movie as a fan would want. But the best part of this design is the action illustrated. Having Marty posed in suspended animation during the middle of a trick (Kick Flip) shows great planning true design skill. It looks retro,futuristic and modern all at the same time. Thus, a flawless execution of the concept. This is a must have Back To The Future t-shirt for collectors. This McFly tee will make a nice gift for the 80's movie buffs just as much as it would for the Back To The Future fans. Children are in luck because this comes in kid sizes too. McFly Tee Design by Danny Haas. Starry DeLorean Tee Design Review. 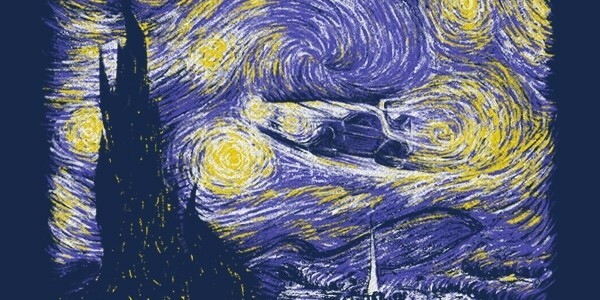 The Starry DeLorean tee design is for the Back To The Future fans that enjoy the art of Vincent van Gogh. The concept is to combine the coolest time machine which comes from the Back To The Future trilogy with the Starry Night sky which is the perfect backdrop for anything dealing with space and time (Space time). This is one of the better Starry Night parodies and mash ups and if you've been paying attention to this blog you may have seen some reviewed already. 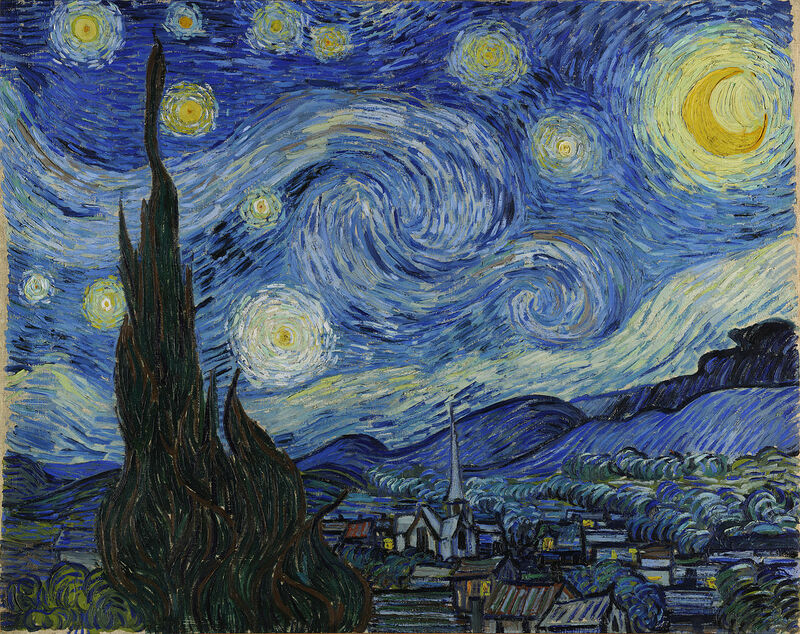 As for the artwork, the style is emulating Vincent van Gogh's obviously with the broad stroke swirls. Not an exact copy but enough to know its basis (No moon for example). The subject of this tee the DeLorean, is ore subtle than inserted than say the parody featuring Serenity. Black fabric is the better choice in this case as it helps all the colors to pop with much greater contrast. I do think this tee would had been even better had Hill Valley and the Clock tower been the town and prominent building depicted. This Starry DeLorean tee will make a nice gift for the Back To the Future fans. Wear this tee to Comic-Cons, Sci-Fi conventions and to art museums. Basically ANYTIME ANYWHERE. Starry DeLorean Tee Design by Punksthetic. Science Club Tee Design Review. 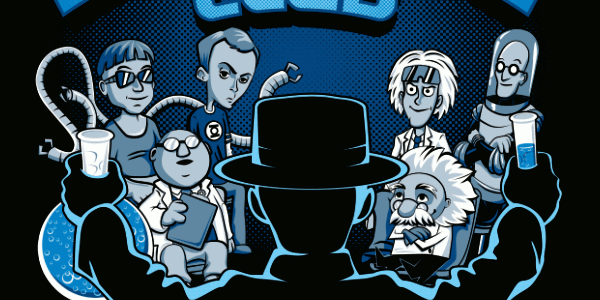 The Science Club tee design is for science buffs and Breaking Bad fans that can't can't get enough of like-minded pop culture characters. The concept is to take a bunch of fictional scientists and put them in a room together, with Walter White as the center of attention. Would they approve or cheer him on? Either way this Breaking Bad fan tee is meant remind everyone of Walter's super chemistry skills and his super villain mindset. As for the artwork, it is clean and professional. White and Blue inks are the only colors used and the color of the fabric blank feels in the rest. The highlights and shading are great for a cartoon and each character's likeness is spot on. Walter's backside is facing us and is complete shadow with highlights providing the non meth clues to his identity. The design is balanced well and is very pelasing to the eye. This Science Club tee would make a great gift for the science buffs and Breaking Bad fans. Bonus if they happen to like the other fandoms that are included. Such as Spider-Man, The Big Bang Theory, Batman, The Muppets, Back To The Future, and of course Einstein (real or cartoon version). While this tee is comical, I wouldn't recommend it as a school garment with the Breaking Bad references. Other than that, this will make a great t-shirt for any casual occasion. Science Club Tee Design by djkopet. I Want To Believe Tee Design Review. The I Want To Believe tee design is for Sci-Fi fans that enjoy Back To The Future and the X-Files. The concept of this design is based on the Back To The Future Hoverboard and the poster "I Want To Believe" that could be seen in "Spooky" Fox Mulder's F.B.I. office. It is also the title of the second feature film installment of the X-Files franchise. An actual hoverboard has been the dream of almost everyone that has seen the Back To The Future II and III movies not just the fanboys. WE ALL WANT TO BELIEVE. So much so that two variations of the hoverboard have been made this year to match the deadline in the movie... the Hendo Board and the Lexus Hoverboard. Though neither are as tweaked out or perfected as the one in the movies. As for the artwork, there is a good full colored illustration of the fictional Mattel Hoverboard in the foreground with a silhouetted Hill Valley Courthouse in the background. Awesome coloring and contrast. Personally I think it is a little weird to see just a hoverboard without a pair of legs attached to it, but that is just me. The 80's children would probably love this tee as the Back to The Future movies are iconic. This is a good BTTF tribute tee as this is the year (2015) that the Marty McFly character traveled to in the in the Back To The Future II movie. The Doctor Is In Tee Design Review. The Doctor Is In tee design is for Back To The Future and Peanuts fans. FINALLY! A "Doctor Is In" themed tee that IS NOT DOCTOR WHO based. 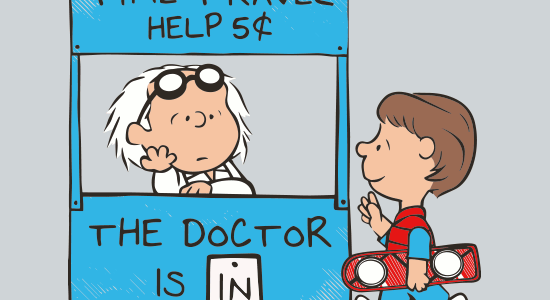 It is nice to see some Back To The Future themed stuff and the Peanuts style works great for the concept. As often as Marty sought out the Doc's help in each of the three movies in the trilogy as well as the cartoon and video game this tee is a no brainer. The added hoverboard is the pièce de résistance that gives it that BTTF feel while keeping the childlike innocence of the Peanuts with the booth. The Doctor Is In Tee Design. 1985 B.C. 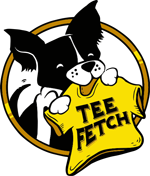 Tee Design Review. The 1985 B.C. tee design is for the diehard Back To The Future fans. The kind that like fan fiction and "What ifs?". Looks like Marty just can't stop altering the past and leaving evidence behind that shows that he was there, out of place in time. You'd think after 3 movies, a cartoon and some video games that Doc and Marty would learn to stay put. 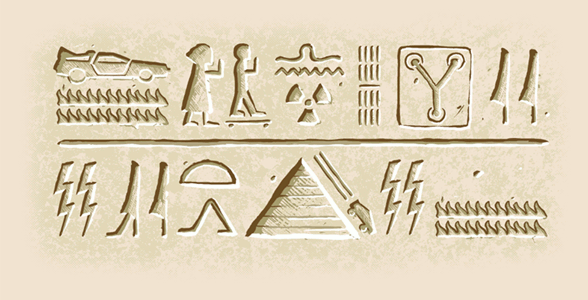 The pseudo Egyptian style hieroglyphics depict that the time machine arrived in tracks of fire and a guy with big hair and a man who moved via standing a board needed plutonium to get their time machine at 88 MPH so their Flux Capacitor could harness the power of lightning. It might show two pines then something happening to one of the pines after some lightning. Before the day runs out they ride down the sides of the Great Pyramid and disappear in a flash of lightning, leaving behind fiery tracks. The 1985 B.C. design is on children's apparel as well, so kids these days can repeat history and enjoy the time paradoxes too. The artwork mimics the Ancient Egyptian style as that was the theme of the design contest. The designer tgentry told the complicated plot of the story in just a few imagined symbols. That takes time and talent to execute and it is far more difficult to achieve than one would think. This Shirt is Temporarily Unavailable Sorry, we're not printing this one at the moment. Check back tomorrow when the catalog re-opens. 1985 B.C. Design by tgentry.